The outdoor sale continues at Aldi, and there are some great outdoor play products on sale this week. I think I might just pick up my toddler's birthday present this week, as there is a great deal on a Little Tikes Basketball Hoop. Lovn Fresh Kaiser Buns Wheat 20 oz $1.69 GOOD PRICE - TASTE GREAT! CROSS COUNTRY SALE- Special Buys Starts May 25th. 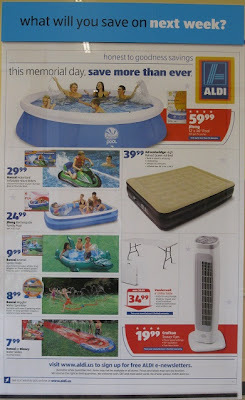 Looks like I need to make a visit to the Aldi store! What great deals!